Former Borussia Dortmund defender Manuel Friedrich has been confirmed as Mumbai City FC’s marquee for the inaugural Indian Super League season. Friedrich, 34, made over 400 appearances in German club football, scoring 41 goals in the process. 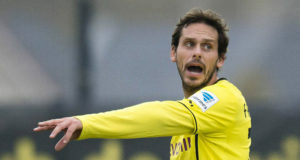 Having spent 6 years at Bayer Leverkusen, making 147 appearances at the Bundesliga club, Friedrich joins Mumbai FC after a one-year stint at Borussia Dortmund. The defensive stalwart’s addition to the franchise strengthens Mumbai FC’s defensive capabilities, especially given his scoring capability from the back. Joining the likes of Johan Letzelter (France) and Pavel Čmovš (Czech Republic) in the the back-line, the Mumbai side will be seeking to counter the attacking strength of the likes of Kerala Blasters.